President Donald Trump is set to arrive in England today after having attended the NATO summit in Brussels. Demonstrations across the country will begin tonight against the American president. Trump will be spending very little time in London during this visit, unlike previous American presidents who have visited the UK. In fact, former presidents have even slept over at Buckingham Palace, however, Trump will not receive the same royal treatment. Instead, he and Melania will spend the night at Winfield House, where the US ambassador to the UK resides. Trump will meet the Queen elsewhere during the trip. Thousands of people are expected to attend protests throughout the Trump visit, with 60,000 people registered as "attending" on Facebook for the main protest on Friday. 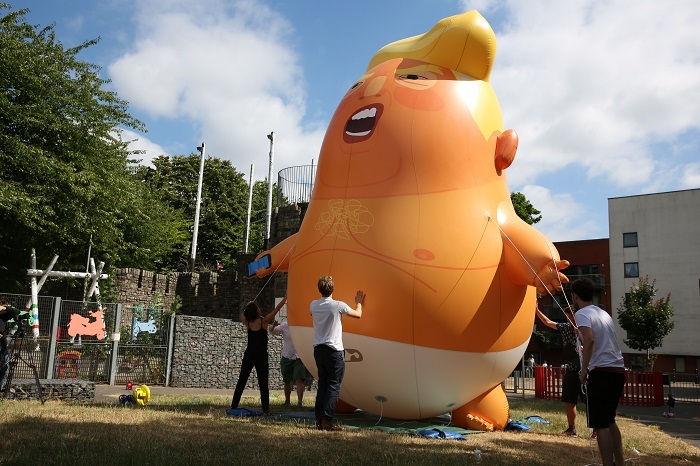 A giant, orange "Trump baby" balloon will fly from Parliament Square Gardens on Friday morning after London mayor Sadiq Khan gave permission for it to fly. Campaigners raised £16,000 (over $21,000) to pay for the 19-foot balloon. More than 10,000 people signed a petition in support of the balloon. A recent poll in Britain this week found that 42% of Britons believe that Trump should not have been invited to visit the UK at all. The Labour party also does not support the visit. Green Day's 2004 hit song "American Idiot" is topping the UK charts ahead of the president's visit. Trump appears to be taking great lengths to avoid the protests. For example, regarding his stay at Winfield House, he will be able to land a helicopter there to avoid protesters. He is barely spending any time in London, instead spending time outside the city in locations where protesters can be kept out of sight. He also will not be taking part in the typical photo opportunities at Downing Street and other famous landmarks. Nevertheless, the US ambassador to the UK said that "the president is not avoiding anything." Trump will depart from England for Scotland on Friday, where demonstrations against the president will continue. He is expected to spend the majority of his time in Scotland playing golf at his two golf courses there. Scotland is demanding that the British government cover the cost of Trump's golf course visits, estimated at $6.6 million for security. It is believed at this time that Trump will avoid paying for his weekend golf getaway himself as billing it as a business expense.